:Karen Stubbs encourages and inspires mom in this beautifully bound LuxLeather devotional.Whether you are a first-time mom of a newborn or a seasoned mom of a teenager, Karen Stubbs knows that you need encouragement and a little time out. This year-long devotional will meet you where you are and accompany you through the rewarding, often challenging yet God-ordained journey of Motherhood. 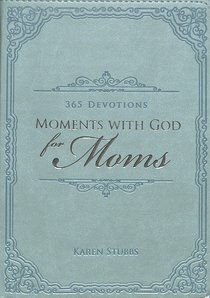 About "Moments With God For Moms (Light Blue Luxleather) (365 Daily Devotions Series)"